This paper analyzes how easy or difficult is for local entrepreneur to open and run business with small and medium-sized enterprises when it meets the relevant legislation. From the changes in the regulations that influence the life cycle of the business, we will set the perspective for starting a business. This paper will consider the business environment in terms of starting a business. The paper presents data on the indicators for quantitative indicators for business regulations and the protection of property rights that can be compared across several economies of comparators of countries in the region and R Macedonia. Since standard assumptions are used in the data collection, comparisons and benchmarks are valid in the mentioned economies. The data, in addition to highlighting the degree of business barriers, help identify the source of those obstacles, supporting policymakers in designing regulatory reform. Key words: business environment, start-up business, Macedonia, region. SERAFIMOVA, Mimoza. IMPACT OF THE BUSINESS ENVIRONMENT ON THE CONDITIONS FOR STARTING BUSINESS IN REPUBLIC OF MACEDONIA. 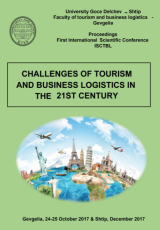 Yearbook - Faculty of Tourism and Business Logistics, [S.l. ], v. 3, n. 2, p. 305-312, feb. 2018. Available at: <http://js.ugd.edu.mk/index.php/YFNTS/article/view/2214>. Date accessed: 21 apr. 2019.